My first climb to the summit of Mount Rainier, a few days after my arrival from Los Angeles, was via the Kautz Route in a large party of park rangers and guides led by Paradise District Ranger Bill Butler. The climb was an annual affair designed to scout the route prior to taking paying clients up the mountain. By this time Butler was already something of a Northwest legend because of his many search and rescue trips on the mountain since the early 1930s. Dee Molenaar, Neophyte Guide. Courtesy Dee Molenaar. Early in the hike to 11,000-foot Camp Hazard, fellow neophyte guide Ken Spangenberg and I were exposed for the first time to the slow but steady "rest-step" pace used by the snow-slogging climbers of Northwest volcanoes. This was a real contrast to our hiking style—fast and with frequent rests—on the trails of the San Gabriel and San Bernardino Mountains and the Sierra Nevada of California. The climb up and down the Kautz Ice Cliff or through the adjacent ice chute also taught me the techniques of ice climbing with our eight- or ten-point crampons, chopping steps with the ax where it got steeper, belaying with the ax shaft at snow-bridge crossings of crevasses, and rappelling down the ice cliff and chute on a rope doubled around ice pinnacles. We also learned to rapidly glissade down the softened snows of “The Turtle,” the vast 2000-foot snow slope below Camp Hazard. During my eight guided summit trips in 1940-41, seven were all male. These included both novices and experienced mountaineers. Among the latter were several distinguished alpinists from around the U.S. and Europe, although at that time most of their names were not familiar to me. 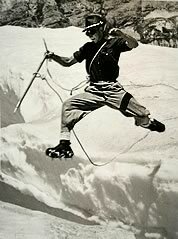 Among the famed climbers visiting the mountain during my first year were Seattle mountaineer Ome Daiber and New Englanders Henry S. Hall, Jr., Kenneth Henderson, Joel Fisher (all officers in The American Alpine Club), and Walter Prager, renowned skier and coach at Dartmouth College in New Hampshire. 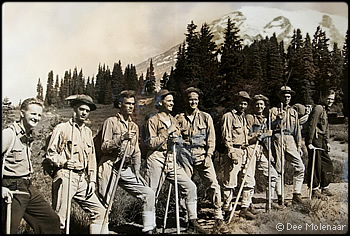 In 1940 Prager climbed Rainier while scouting terrain for future training of a ski and mountaineering outfit being considered by the U.S. Army. In August 1941, upon my return from leading a summit climb, I learned of a tragedy that was unfolding on the north side of the mountain. Several park rangers and a couple of RNPCo employees, including my brother K, had already driven around and were hiking to the Russell Glacier, where 21-year-old Leon Brigham, Jr. had fallen into a deep crevasse. His body was recovered late in the day by rangers Bill Butler and Gordon Patterson. As a guide in 1929, the victim's father, Leon Brigham, was badly injured in a similarly tragic crevasse accident high on the mountain that took the lives of Edwin Wetzel and apprentice guide Forrest Greathouse. My last summit climb of 1941 was with a group of seven Navy ensigns stationed at Bremerton. They were all young, eager and in top shape and had no problems negotiating terrain with which none had any previous experience. Later, I learned that five of the seven died at Pearl Harbor on December 7, 1941, only three months after our enjoyable camaraderie on the mountain. My final climb of the summer of 1941 was with my brother K. By then I knew the Kautz Route well and we made good time, leaving Paradise at noon, arriving at Camp Hazard by 6 p.m., leaving Hazard at 4 a.m., reaching the top at 6:30, then descending and arriving back at Paradise by noon. We were proud of our fast climb, as was Clark Schurman, but as chief guide he couldn't openly condone such speed-climbing. In those days setting time records was considered “bad form” and frowned upon as improperly appreciating the mountains. Schurman was obliged to inform us of the strong feelings of RNPCo president Paul Sceva, who felt we were “trying to make the mountain look easy,” which would discourage visitors from hiring guides. Ken Spangenberg jumping a crevasse. Courtesy Dee Molenaar. In the late 1930s and early 1940s, Mount Rainier and Grand Teton National Parks were the only ones in the country with professional mountain guide concessions, and the government subjected these operations to periodic scrutiny by The American Alpine Club. During the summer of 1940, AAC officers Henry Hall and Kenneth Henderson visited the Guide House to meet with Clark Schurman, and they apparently approved his handling of the concession and our proficiency as guides. At the end of the summer of 1940 Clark Schurman presented me with a framed certificate (still attached to my studio wall) that implies I had mastered the craft of mountain guide. I didn't get rich guiding at Paradise during those summers prior to World War II, and I made only a little toward defraying my costs at Los Angeles City College. We guides were paid $200 per month, from which $100 was deducted for room and board. For leading summit trips we were paid an extra $25 and for assisting we got an extra $15. Today summit trips with Rainier Mountaineering, Inc. guides cost clients more than $800 each, which includes a preparatory day of snow and ice-climbing instruction. During that first summer at Mount Rainier I learned quickly and soon became confident of my ability, both physically and mentally, to scale higher and steeper peaks. Leading clients—most carrying only alpenstocks—up the steep ice chute and ice cliff of the Kautz Route taught me much about ice climbing in the era before short-handled ice hammers and rigid-frame 12-point crampons. We learned to cut steps, use crampons to climb steep ice pitches, and rappel down the ice cliff during the descent of the mountain. I also learned a lot about pitching camp, mountain cookery, and surviving bad weather. The most enjoyable part of guiding on Mount Rainier was meeting among my clients a varied mix of people from many walks of life, including laborers, students, doctors, lawyers, and scientists. Occasionally, I led skilled climbers who had scaled high peaks in the Alps, individuals who commonly hired guides as much for companionship as for knowledgeable leadership. Dee Molenaar is author of The Challenge of Rainier, the definitive history of climbing on the Northwest’s greatest peak. This article is an excerpt from Dee’s autobiography, tentatively called High and Wide with Sketchpad, which he hopes to publish in the near future. The book covers Dee’s life of travel among mountains and deserts, with artistic impressions of what he has seen. Dee has participated in numerous mountaineering expeditions, including Mount St. Elias (1946), K2 (1953), Mount McKinley (1960), and Mount Kennedy (1965). An artist since childhood, Dee developed a habit of carrying a small box of paints to capture impressions of outdoor scenes. He has painted scenes on the spot from below sea level in Death Valley to 25,200 feet on K2. Dee learned to take stereo (“3-D”) photo pairs while flying over mountainous terrain, by snapping two photos a few seconds apart along the plane's flight path. These photos enabled him to view Earth’s landforms in greater detail, helping him prepare oblique-perspective maps of the Pacific Northwest and beyond.